Are you in the market for an action camera? If you've already narrowed your choices down to GoPro Hero 5 vs Session, one thing's for sure—you've determined there's no substitute for the GoPro brand of cameras. While the best cameras make capturing extreme moments look effortless, there's a lot more to choosing the right sports action camera than point and shoot. But what are the key differences between these two GoPro5 cameras and which one should you buy? What Is QuickCapture and How Does It Work? First, let's take a step back to learn more about what makes the GoPro brand special. The GoPro brand has been put to the test and repeatedly proven that they are the best in the business. They launched the sports action camera market in 2002, and since then, they have continually remained at the top of the charts. Their success comes from not only introducing new features and staying ahead of the game in usability and functionality but by keeping the sky-diving, drone-flying, wall-repelling crew doing what they do. 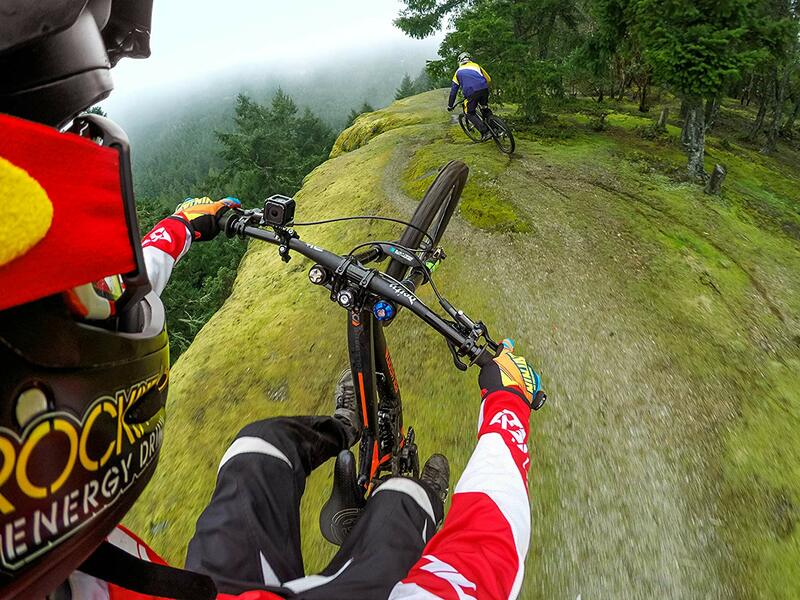 GoPro captures the experience in a way that brings extreme sports to life even if you weren't there when it happened. 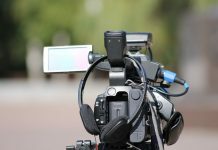 "They don't just sell a video camera, they sell the memory of the wave or the ski trip down the slope," says Ben Arnold, a consumer technology industry analyst at The NPD Group. So where did the name originate? The story is told that the GoPro founder, Nick Woodman, made his first action camera model out of a surfboard leash, rubber bands, and a disposable Kodak. He named it after the thing most surfers dream of—going professional. Get it? Go professional; simple, yet so fitting. 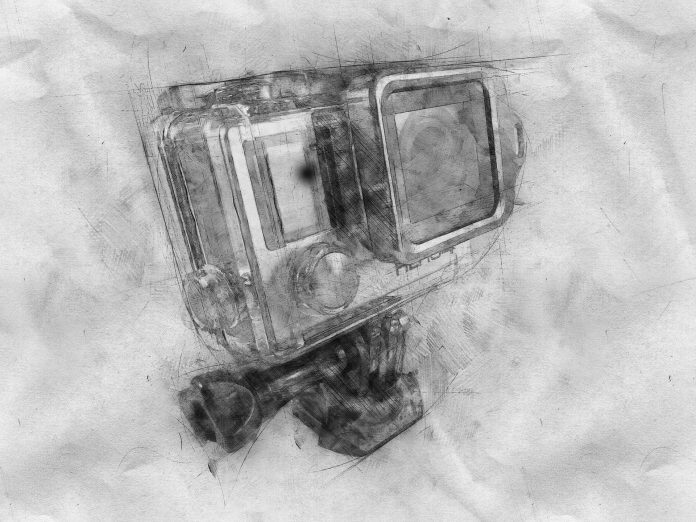 Now that we've gotten that out of the way, we can review details to determine which GoPro camera is for you. Before you dive head first into splurging on a camera, we need to crack the code on the GoPro Hero 5 vs Session feud by first understanding the naming rationale. 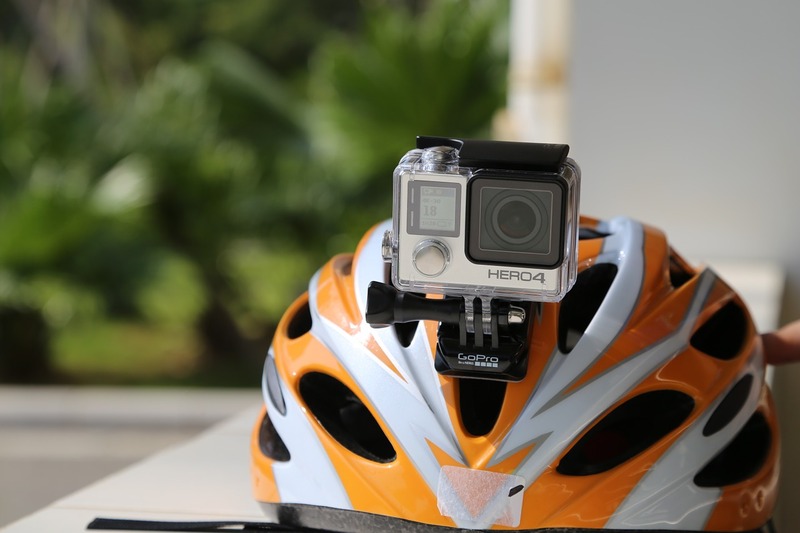 Typically, GoPro uses a color-coding system to identify its cameras. The ‘Black’ label is its indicator for the top-end model regarding picture quality and price and can be thought of as pro-level equipment. The reason for the hot debate over GoPro Hero 5 vs Session is because the cameras were introduced together as two models making up the ‘Hero5’ family. 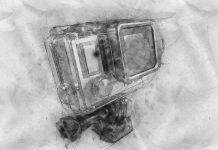 They unveiled both models on October 2, 2016, at the launch event for the GoPro Karma drone at Squaw Valley Ski Resort in Northern California. 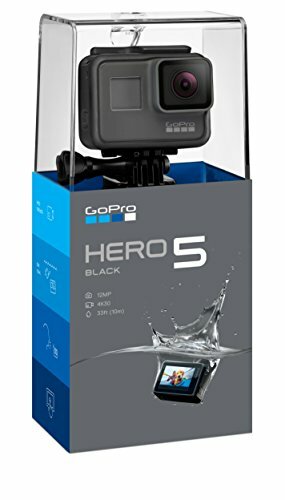 The Hero 5 Black was introduced at $399, while the Hero 5 Session came in at $299. 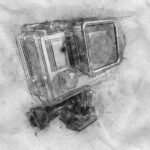 Interestingly, the cameras share a surprising number of specs and traits, including being compatible with GoPro's first quadcopter. At its introduction, they considered the Hero 5 Black GoPro's most versatile camera yet. As the successor to the Hero 4 Black and Silver, the Hero 5 Black combines the best features into one package, including their ability to capture amazing images. This camera can be purchased online for around $250. Plus, with over 1500 Amazon.com reviews, and an average customer rating of 3.8 out of 5 stars, people seem to be pleased with the purchase. 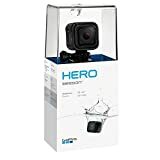 As you have come to expect from GoPro brand action cameras, Hero 5 is waterproof without the need for additional housing. It allows you to dive as deep as 33 feet or 10m on its own. If your underwater exploration requires more, add a Super Suite and go almost twice as deep (60m). This camera uses hands-free control. Just speak using simple voice commands and the camera will comply with a few simple requests. This feature comes in handy when you work alone or need to take a group picture and nobody's willing to be the photographer. It will understand your command in any of seven languages (English, French, Italian, German, Spanish, Chinese and Japanese). Everybody appreciates a simple touchscreen. We're comfortable using one, and frankly, most expect touch capability when we see a screen. For the Hero 5, this feature allows easy access to modes, settings, and wireless connections to name a few. Thanks, GoPro! Auto upload takes the hassle out of transferring data. It streamlines the process by allowing you to send footage straight from your camera to your GoPro Plus cloud account. It's always helpful to know where you've been. As time passes, recalling one beach from another can be like telling the difference between the baby pictures of twins. No reason to fret, GoPro has you covered. The GPS captures the location where you took your video and photos, so you can geotag your images in much the same way as a smartphone camera. With this, you can rest easy. What bigger concern can you have with an action camera than battery life? GoPro heard you. The Hero 5 offers increased current battery capacity from its predecessors to 1220mAh. Not only is this battery larger, but it's rechargeable. What this means for you is that the Hero 5 can instantly be replenished by popping in a spare battery. With the addition of the C port, the Hero 5 relies on the Supercharger which supports fast charging. The Hero 5 also adds a micro HDMI connector, allowing you to plug the camera straight into a monitor or TV for display. The primary reason we choose an action camera is for its video and photo taking capabilities. In this area, GoPro remains at the top of its game. With advanced image stabilization, you can capture stunningly smooth video whether you are holding your camera in your hand, it's mounted to the handlebars of your bike or helmet, or wherever you place it. You'll have no worries about the quality of your video and outdoor photos when using the Hero 5. This feature offers increased flexibility when using advanced photo editing software. Including RAW capability means you can do a lot of image tweaking in post-production, just like many smartphones. The wide screen makes it easy to record videos on your own, and capture added detail in shadows and highlights in the scene. Thanks to this feature, you can capture killer shots with detail even in dark areas. The Hero 5 Session goes by the moniker "So small, so simple." It just looks different, with its small, cube-shaped design. This perfectly describes what you get with this grab-and-go one-button action camera. It's recognized for its simplicity in design and operation. It does everything it needs to do with the touch of a single button. Wearing your Hero 5 Session is an awesome way to share your journey and show it from your perspective. It’s also an easy way to keep your hands free, so you can focus on what you’re doing while capturing what you’re doing. Hero 5 Session comes with everything you need to capture your adventures or even just a day in the park. When you purchase this camera, you will also get a standard frame (for Hero Session cameras), USB-C charging cable, mounting buckle, thumb screw, curved and flat adhesive mounts, and a handy Quick Start guide. QuikCapture lets you automatically start and stop capturing video and photos on your GoPro. When the camera is off, one press of the shutter button turns the camera on and immediately captures video or time-lapse photos. 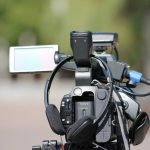 You can record a video with a short press. Press and hold to capture time-lapse photos. Press again to stop recording and power off the camera. QuikCapture also helps conserve battery power because the camera is on only when you’re recording. This single-button feature makes life easy. Access and enjoy your GoPro photos and videos on your computer, phone or tablet, or in the cloud. Quik for desktop makes it easy to import photos and videos from your camera or microSD card. You can also use Quik to transform your footage into awesome videos synced to music, share with friends, update your camera and more. Get started by downloading Quik to your desktop computer. If you prefer to use your phone or tablet, use the Capture app. For access to your photos in the cloud, you need a GoPro Plus subscription. Here you can automatically upload photos and videos to the cloud directly from their Hero 5 videos in the cloud, or access, edit and share your best shots anytime, anywhere using the Capture and Quik mobile apps. This tiny little device packs a big punch, especially in the color department. It offers a range of color options, even allowing you to adjust the color profile of your video footage. There's also a convenient color correction feature in case you have to match your footage with video recorded on a different device. This can be handy if a battery dies, and you need to switch devices. You'll appreciate this level of color flexibility in post-production. Now that we've reviewed their specs and features individually, let's look at this side-by-side comparison of the GoPro Hero 5 vs Session. The GoPro Hero 5 Black will run you about $50 more than the Session. Although the Session is noted for its size, at 4.48 ounces it weighs slightly more than the Hero 5, which is 4.16 ounces. Both cameras maintain an equally rugged and waterproof design. Both models come with a USB-C socket which doubles as the charging port. The Hero 5 Black also adds a micro HDMI connector, allowing you to plug the camera straight into a monitor or TV for display. Both come with a microSD card slot supporting Class 10, UHS-I rated cards, or those marked with the ‘Works with GoPro’ logo. Both models also support Bluetooth and Wi-Fi connectivity. The Hero 5 Black has a slightly larger lithium-ion rechargeable battery (1220 mHa vs 1000 mAh). GoPro estimates a battery life of two hours for the Hero 5 running at 1080p at 50fps, with GPS, Wi-Fi, voice control and image stabilization off. A battery test was used to exam performance. This test resulted in a full battery drain in 1 hour 54 minutes, coming very close to the official line. The Hero 5 Session is powered by a built-in 1000mAh lithium-ion battery. A battery test was performed on the Hero 5 which revealed this device recorded 1 hour and 58 seconds before the battery showed less than 10% of life left. When we left the camera indoors for a full-to-empty run-down test, the 32GB memory card ran out before the battery did. When the testers cleared the card and continued recording, they concluded there was 1 hour, 50 minutes and 15 seconds of recorded video. Both shoot 4K footage at a max of 30 frames per second, and both are water resistant out of the box up to 33 feet without a housing. Each camera also has voice control, with seven languages supported at launch. And both can automatically back up footage and photos as part of the new GoPro Plus cloud-based subscription service. Both cameras have GoPro’s ProTune video mode, which allows users to capture a flatter image that is easier to color-correct when editing. Each camera comes with stereo microphones, too. Both cameras come with plastic cages that have the standard GoPro built-in mount. This is convenient if you want to mount either of them to your handlebars, saddle rails or chest strap, but you must put them in their cage first. It may not look as clean as you might like, but it means the touchscreen will work as normal, and you won’t have to rely on the spongy buttons of the older Hero 4 waterproof cases. The Hero 5 Black looks like a more rugged Hero 4, shoots 12-megapixel photos, comes with a 2-inch LCD touchscreen, features built-in GPS, and can capture RAW photos and Wide Dynamic Range video. The Session is considered a high-performance video and photo device. 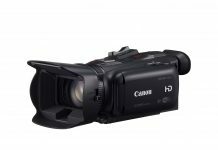 With a resolution of 1440 pixels per inch, it delivers sharp, professional video. It only shoots 10-megapixel photos or in burst mode will capture at 30fps, which is probably because of the smaller sensor. However, when you combine its video power of 1080p and 8MP, it falls short when compared to the Hero5. On top of that, with the Session, there’s also no screen, no GPS, and no RAW or WDR modes. The Session relies on one-button control, while the Hero has dedicated buttons for photo and video recording. Another area where this little giant falls short is when you need to preview and playback your shots, change settings and trim your footage. 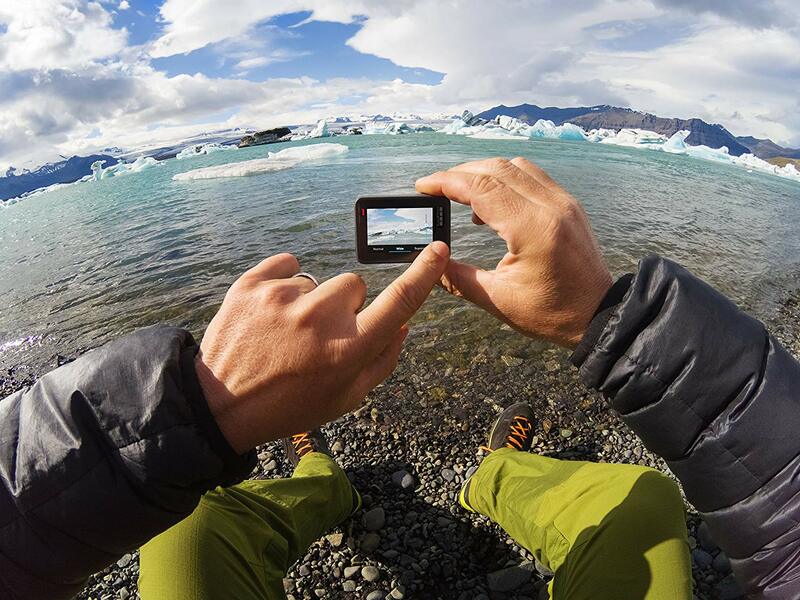 You can perform all of these functions directly on the 2-Inch touch display of your GoPro Hero. The Session's economy of scale doesn't leave room for this option. So what should you choose in the GoPro Hero 5 vs Session battle? There's really no comparison. They made these two cameras for different purposes. GoPro designed the lower-priced Session as a companion camera. It's perfect for the first-time GoPro user, or as a second camera. It is compact, and easy to use, which reduces the learning curve for customers who choose this device to almost zilch. It's quick and easy to pop it on the side of your helmet and go. On the other hand, if your active lifestyle requires a long battery life, then the Hero 5 would work best. Knowing you have limited battery power with the Session and no replacement option can be a real inconvenience. With the Hero 5, you can swap out batteries mid-activity, giving you more access to capture long bike rides or hikes. As long as you have a spare battery, you won't miss a beat. If your decision comes down to cost, again there's no competition. With a $50-$100 price difference, the Hero Session is your best choice.